From Wednesday, December 11 to Saturday, December 21, "The 7th International Week 2013" is being held at Mie University. This is the final event week of Mie University, focusing on International Exchange opportunity. The university offers number of events for the students, teachers as well for the residents of the area. On Thursday, December 12, the entitled lecture and the movie show were given at Mie Environmental & Informational Platform (MEIPL building). 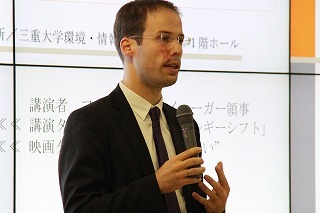 Dr. Florian Jäger, Consulate-General of the Federal Republic of Germany in Osaka-Kobe, gave the introduction about the change of the energy system in Germany: "Energy shift in Germany". After the lecture, the movie "Schönau's thought (Das Schönauer Gefühl)" was showed. Almost 150 audience were concentrated to the citizen's movement in Schönau city, to start to supply the natural energy, motivated by the Chernobyl disaster. Q & A session was held as well after the movie.